A number of senior living community operators host events in their greater communities in the hopes of raising awareness among prospective residents—but in many cases, these events can, and should, be conducted differently. Specifically, some operators are not correctly employing the use of demographic data and knowledge about prospective consumers, according to Valerie Whitman, vice president of senior living for Tampa, Florida-based marketing firm LeadingResponse. 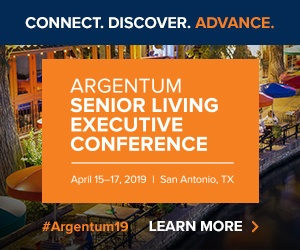 “If you are not targeting beyond basic demographic criteria, you need to,” Whitman said during a presentation at the 2018 Argentum Senior Living Executive Conference in San Diego last week. 1. Target attendees based on affordability factors. According to LeadingResponse’s findings, the 2.4% of respondents who RSVPed positively to offsite community event invitations had a household income of more than $75,000; had income-producing assets in excess of $250,000; had a net worth of more than $500,000 and had more than $75,000 in home equity—all of which demonstrate some financial capacity among prospective residents to be able to afford senior housing. For that reason, using only age, income, zip code and homeowner data can lead to an RSVP rate that is 50% lower than with more targeted data, LeadingResponse has found. 2. Hold events offsite, not at the communities themselves. Offsite events outranked onsite events by a measure of two to one among both prospective resident attendees and caregivers. Events held offsite also generated more tours and move-ins than those held onsite. While holding events offsite can be more expensive than hosting within the community walls, there are some ways to keep costs down, Whitman said. Hosting an event at a restaurant with a large group over the course of two separate dates may allow the community to negotiate with the venue to stay within its per-person budget. 3. Employ follow-ups to increase tour count. The rate of tours among those who attended off-site community events was high, with 74% of those who attended agreeing to tour the community being promoted. Additionally, the inclusion of two distinct follow-ups helps in securing tours, Whitman said. “Folks don’t necessarily want to tour right away,” she said. “Have the opportunity to do a pre-tour phone call, or connect over email. Lots of people just want to initially email or text. Sales counselors need to think strategically about the next steps for each family. This may mean first having a scheduled follow-up phone call with a family member influencer before the local family is ready to come in and tour. “Everyone’s time is valuable and most consumers today will not take the step of coming in to tour until they have all the information they need, so provide them with that information and do so in a neutral less threatening environment, offsite,” Whitman said. Post-event evaluation forms and pre-tour phone appointments are two ways to correspond with prospective tour-goers in a more passive way, she noted. The No. 1 topic attendees want to talk about at marketing events is cost or price, according to the survey of those who attended the events. When the topic was included in the event invitation, the invitation generally produced greater response rates. The industry has long grappled with whether to list pricing on community websites, with many operators continuing to defer conversations about pricing until a sales lead is more qualified or has arranged a follow up appointment. In the LeadingResponse findings, 67% of respondents said they wanted more information on cost.